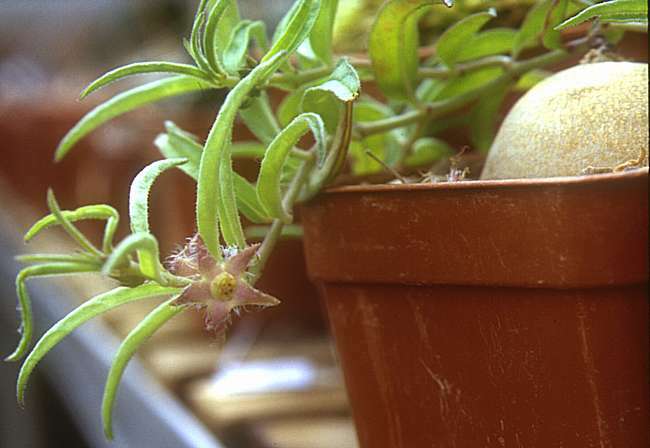 Brachystelma was first described by Robert Brown in 1822, with a coloured plate of B. tuberosum the type species from the Cape, although B. caudata had earlier been collected and described as Stapelia caudata by Carl Thunberg. The species depicted is now known as B. decipiens, because the name B. tuberosum belongs to a different species not included in the original description. Recent investigations have suggested that the editor (Sims) of the Journal (Curtis's Botanical Magazine), in which the genus was published, may be more properly regarded as the publishing author. The 100 + named species are found predominantly in tropical and southern Africa, but have an extensive distribution into Asia including India and into Australia (1 species). Some caudiciform species are reported to be edible when baked and their tubers are eaten by Bushmen. The genus consists of plants with one or more tubers from which may come fleshy roots. The tubers grow naturally under the ground, but are usually raised above the compost when cultivated in pots. The vegetative growth from the top of the tuber is seasonal and consists of one or several branching or unbranched stems with opposite leaves. In most species the stems are dwarf or prostrate, but several species grow up to 60 cm tall. 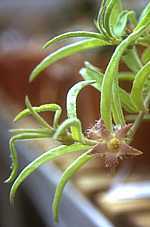 The five-lobed flowers may be solitary or may consist of multiple florets, in which the tips of the lobes are fused to form a cage or may be unjoined. Many species of Brachystelma have odourless flowers (to the human nose) but some have an extremely putrid odour, with the attractive purple and green cage-like flowers of Brachystelma barberae said to be one of the most offensive. The purpose of this unusual perfume is to attract flies - often blowflies - to pollinate the flowers. The rot-sensitive tubers are generally grown on the surface of a gritty compost, and an extra layer of grit between the tuber and compost may be an advantage. 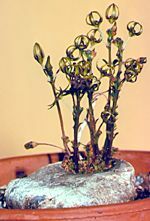 Watering should be light, and should commence when the seasonal growth begins to appear from the top of the tuber, and continue until the yellowing leaves indicate the intention of the plant to become dormant. The growing season, and therefore the period for tuber enlargement, will be lengthened by warm conditions, but cool (10 C) absolutely dry overwintering will ensure that the tuber neither rots nor dries out beyond recovery. 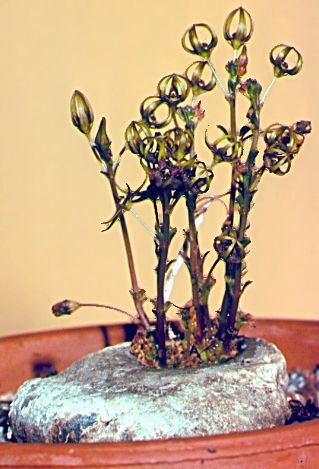 Brachystelmas are very susceptible to mealy bugs, especially where the stems emerge from the tuber, and can show their resentment of over-enthusiastic application of systemic insecticides by losing their vegetative growth. Root mealy bug can also be a problem, and the resultant loss of roots can lead to premature loss of vegetative growth or rotting of the tuber. Bought as Brachystelma namaquensis but that doesn't seem to be a valid name. from the South African Transvaal.